Weddings are truly unique to each couple and a having Viking themed wedding has surged in popularity in recent years. This could be due to a rise in themed weddings and cosplay in general, a love for the hugely popular TV show ‘Vikings’, or even as a homage to a couple’s upbringing and Scandinavian ancestors. Whatever any couple’s reasons for wanting a Viking themed wedding, a wedding shout out to Norse culture is fun, unique and will have guests raving about the big day in the years to come. Viking weddings typically lasted a week and were traditionally held on a Friday due to Norse religion, where Fridays were sacred days for Frigga, the Norse goddess of marriage. You won’t be able to have a week long wedding unfortunately and it will be tricky to have your wedding on a Friday due to work commitments of the wedding party and guests. However, there are still plenty of other ways for you and your partner to have a Viking themed wedding! You can show the spirit of the Vikings through your wedding attire! Viking brides didn’t traditionally wear white dresses unless their best dress was white. They tended to wear a dramatic flowing dress with ruffles and plenty of layers, on top of an under-dress. On top of their Viking wedding dress, Viking brides wore a fur cloak and a headdress. However, the emphasis was on their hair, rather than on the dress – the longer the hair, the better! Viking wedding hair was braided in all elaborate and voluminous styles, before finishing with a floral crown. 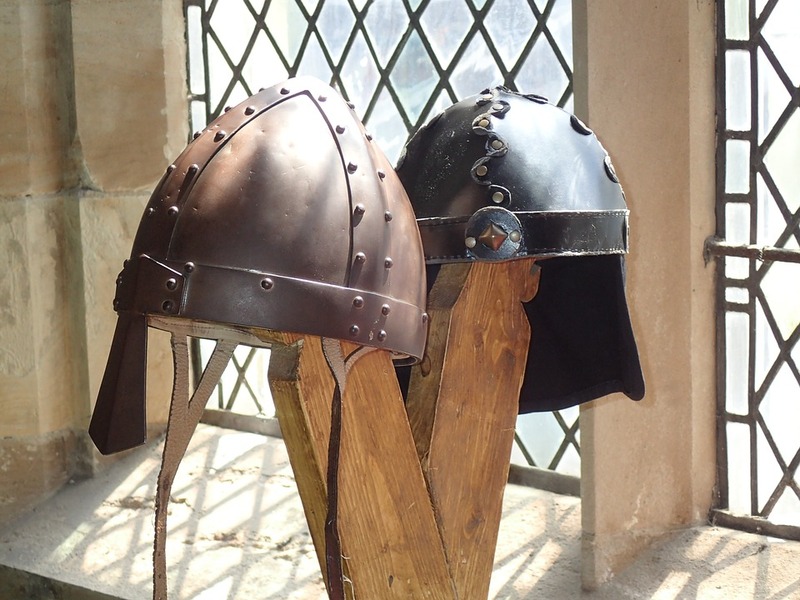 Viking grooms on the other hand, wore intricate leather Norse vambraces and greaves, alongside their traditional Viking tunics that was worn underneath armour. Animal skin and fur was also worn too and it wasn’t uncommon for Viking grooms to be holding a hammer, axe or a shield too. Decorating the wedding venue is a brilliant idea to really encapsulate upon the Viking wedding theme. There’s plenty that you can do as part of your Viking wedding decorations. For your Viking wedding venue, you should have decorations of fake animal skins and furs, natural wood and Viking decorative motifs, and especially the use of runes too. Runes – perfect for Viking wedding invitations too! Gold coins and necklaces – these would be brilliant for Viking wedding favours! The Viking diet was very similar to a medieval menu; they ate and drank in a banqueting hall, and food consisted of fish (mainly salmon and herring), meat, offal, vegetables, fruit (berries), nuts, grain, stew, bread, herbs and eggs. The Vikings were avid hunters and there was a huge abundance of meat and fish in their diet. Due to harsh winter climates, they had to make the most out of very limited ingredients at their disposal. Overall, it was an extremely healthy diet and Viking wedding food should be similar and fresh. As for drink, honey-based mead was popular amongst Vikings and was made by fermenting honey and water. The Vikings were pagans and they worshipped a pantheon of countless gods such as Thor, Freyr and Odin. In pagan culture, singing and music were important and songs commonly referenced the gods, Midgardr (Earth) and Valhalla (the home of warriors who died in battle). For a Viking musical touch at your wedding, you could have instrumental music played by wooden flutes, lyre and harps. Whilst the Vikings did not have the resources and technology for the entertainment that we have nowadays, they were avid lovers of board games! A hugely popular Viking board game played was ‘Hnefatafl’ (neffa-taffel), a cross between chess and draughts and this would be a great game to play at Viking themed weddings. Outdoor games such as swimming and archery were widespread with the Vikings and children played wrestling and rough ball games, including with child-sized replicas of wooden swords, shields, spears and axes. Finally, no Viking themed wedding will be complete without Viking wedding drinking horns and Viking hats for the guests! Don’t forget to exchange your Viking wedding rings on the tips of Viking swords when taking your vows. 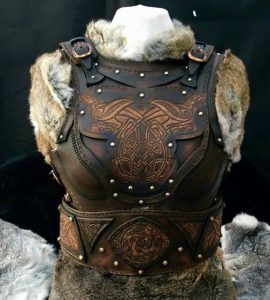 Looking for Viking wedding clothes? Look no further than Black Raven Armoury, with over 20 years experience in creating bespoke LARP leather armour and costume, in all styles and finishes. Outfits are produced to the highest quality, with attention to detail.